(Obsessively) LISTENING TO: Ghost Stories by Coldplay - LOVING this album! Yesterday I mentioned that I'd cast on a new project - it's an idea I've been mulling over for a little while, and if it works out as I hope then you'll be seeing more of it soon enough. The yarn is a new one for me - I haven't used a cotton/linen yarn before, but after the Facebook conversation where many of you kindly recommended different 'vegan' yarns for one of my readers, I thought I'd give it a try. 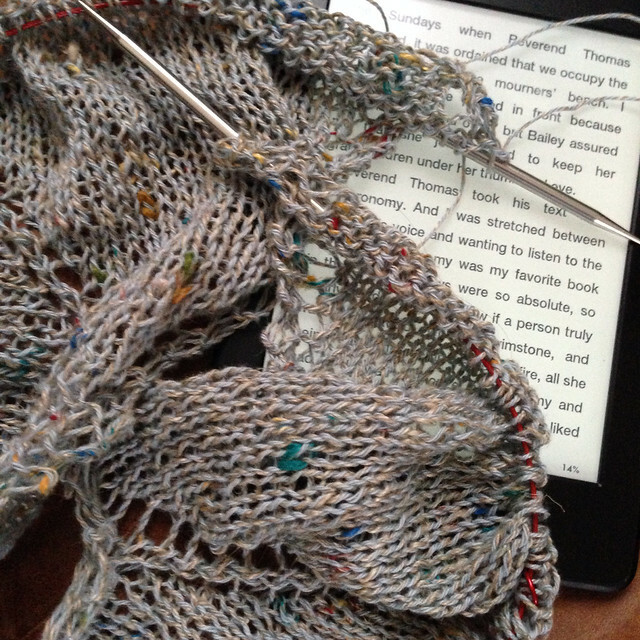 So far I am really pleased with how it's knitting up. There'll be more about it when the project is finished. In the meantime, I'm pleased to announce the winner of the 'My Rag Doll' book giveaway - it's Gill W. who gave all her own rag dolls away to her nieces and has made dolls before so I hope that she will love the book. By the way, I really enjoyed reading the different doll stories - especially finding out that another Sarah had the very same (ugly) doll as me which she posted on Facebook! Thanks to everyone who entered and shared their memories.